I inadvertently made these two recipes the other day and so we had a pink & green Spring Borscht for dinner and a pink & green Rhubabrd Upside-Down Cake for dessert. While unintended, the effect was fun and put a smile on my face. I love borscht but it can be laborious, especially if you’ve been given “The Original Doukhobor Borscht” recipe by your Grandmother and the “way to do it properly” is lurking in your head. This is a quick and delicious way to get a simple, hearty borscht (sorry Grandma!). In large frying pan sauté garlic, onions and oil for 5 minutes over medium heat. Add cabbage and sauté until wilted and soft (about 5 minutes more). Add both stocks and potatoes, and bring to the boil for about 10 minutes, or until potatoes are cooked. 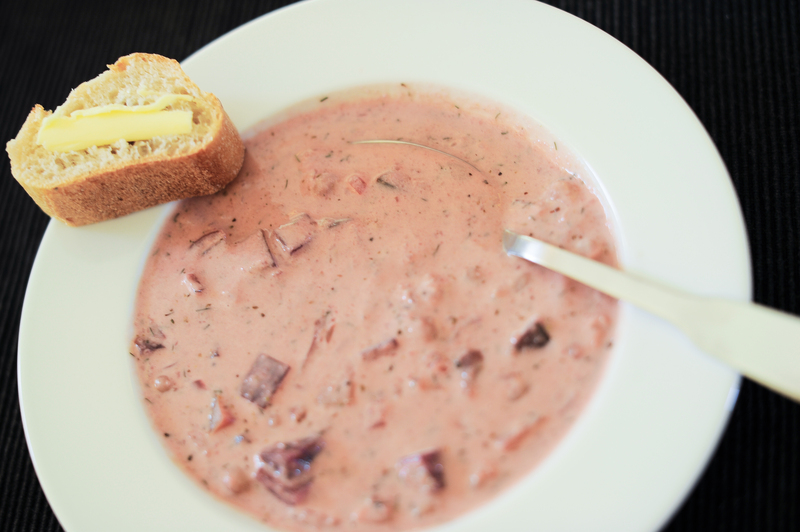 Remove from heat and cool for 10 minutes, then pass ¾ of the soup through the food processor, until completely smooth. Add back to pot, along with the beets, beans, dill, salt and cream, check seasoning and simmer for 10 minutes more (careful not to bring to a boil). When reheating, do not bring to a boil! I ripped this recipe out of a well-known publication years ago and finally tried it. Well, it was terrible! The measures were all wrong so I completely changed it and ended up with a dream desert. It gives me confidence to know that “the big guys” don’t always get it right either. In fact, I suppose since they’re churning out hundreds of recipes in each monthly issue, I should put less faith in them than my fellow bloggers, who are tirelessly testing their recipes until they’ve reached perfection (well some bloggers, anyhow). Three layers and textures make this refreshing desert a real treat. 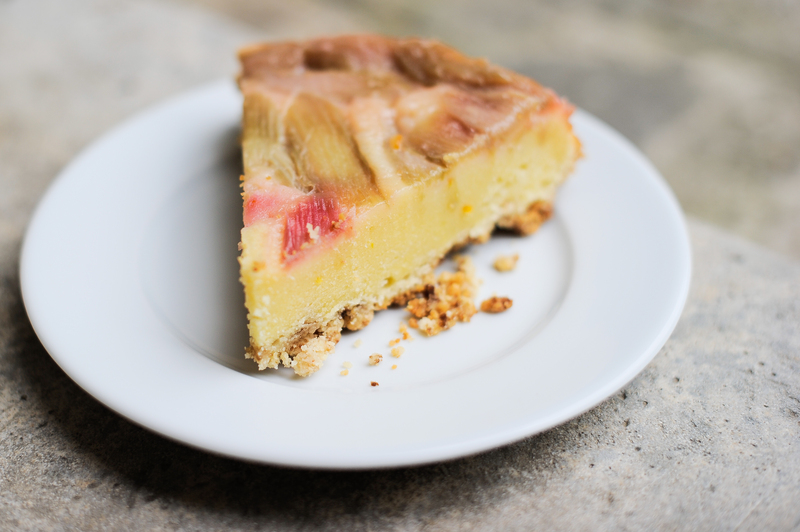 A tart, gooey rhubarb topping, then a citrus cheesecake layer, all sitting atop a sweet and crunchy crumble. The rhubarb topping ends up looking like a stained glass window in pink and green, perfect for any sort of elegant occasion. Makes me think of garden parties, ‘Ladies who Lunch’ and Lily Pulitzer dresses. Preheat oven to 350ºF. Butter a 9-inch round cake pan and dot with 4 tablespoons of butter. 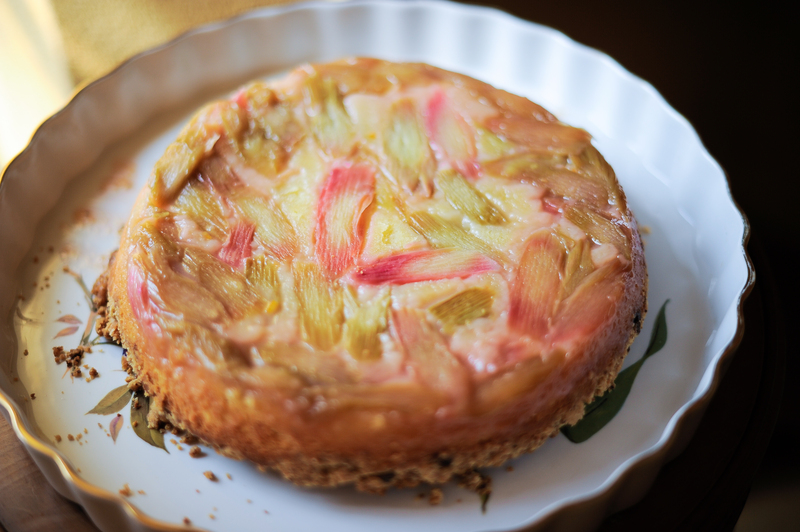 Toss rhubarb with ¾ cup sugar, let sit for 2 minutes, toss again and then press into bottom of cake pan. In a small bowl, whisk together flour, baking powder and salt, and set aside. In a large bowl cream together 1 cup sugar and ¾ cup butter with an electric mixer or whisk (and considerable elbow-grease), until batter becomes fluffy and pale. Add zest and juice, then beat in eggs one at a time. Beat in 1/3 of flour mixture, then half the sour cream, then another 1/3 of the flour, the rest of the sour cream, then the last 1/3 of the flour mixture. Spread evenly over rhubarb mixture, top with crumble and bake for about 1 hour, or until a toothpick inserted in the center comes out clean. Let cool for 10 minutes, then run a knife around the edges of the cake and invert onto whatever dish you’ll serve the cake on. Do this after 10 minutes of cooling, no more or less, or the cake might stick. If you don’t have a zester or micro plane, simply peel off some of the orange rind and cut away all of the white (bitter) rind, saving only the orange rind. Slice as thin as possible and you’re good to go. Tags: beets, borscht, borscht recipe, cabbage, cake, crumble, dinner, doukhobor, green, pink, rhubarb, sour cream, spring, stained glass, two for one, upside down, vegetarian, zest. Bookmark the permalink.